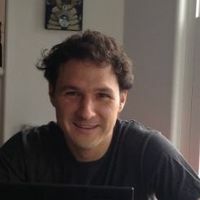 Jed McCaleb is an American programmer. He was the creator of Mt. Gox, the trading card website that briefly became the world's largest bitcoin exchange until it ceased operations in 2014. He is also one of the original founders of Ripple, though he left the company in 2013. He co-founded Stellar in 2014. McCaleb was born in Little Rock, Arkansas in 1975. He briefly attended the University of California, Berkeley; he dropped out his freshman year to found a company called MetaMachine, which created a decentralized peer-to-peer file sharing network called eDonkey. He ran MetaMachine for five years before founding another company called Code Collective, which developed a video game called "The Far Wilds." He turned management of the company over to fans of the game in December 2009. McCaleb created a website called Mt. Gox, an online marketplace for buying and selling cards for "Magic: The Gathering," a trading card game. He later converted it into a bitcoin exchange before selling it to Mark Karpelès in 2011. It became the world's largest bitcoin exchange before ceasing operations in 2014, following a number of disastrous technical issues and hacking attacks. McCaleb began the process of creating Ripple Labs in 2011. The company was officially founded in August 2012. In doing so, he sought to "improve" upon the capabilities of bitcoin, using Ripple's digital currency XRP to create a peer-to-peer payment system that could convert one currency to another, using XRP as an intermediary currency. McCaleb left Ripple in July 2014, though he remained on its board of directors for some time. In 2015, the cryptocurrency exchange Bitstamp initiated legal action against McCaleb and two of his family members for selling over $1 million worth of XRP, which Ripple Labs claimed was in violation of a contract agreed upon by McCaleb and Ripple Labs signed in 2014. Bitstamp claimed that, due to complaints received from Ripple, Bitstamp was unable to determine who was the rightful owner of the funds. U.S. District Judge William Orrick ordered that the funds be temporarily frozen. The lawsuit was settled in 2016. As part of the agreement, McCaleb received the full amount of the funds that were originally frozen, and Ripple had to pay Bitstamp's legal fees. McCaleb no longer has any role in Ripple's leadership. After McCaleb left Ripple, he founded the Stellar Foundation in 2014. Unlike Ripple, a for-profit company, McCaleb created Stellar as a nonprofit organization. In October 2017, IBM announced it had partnered with Stellar to simplify cross-country payments for people in the South Pacific. In a 2018 interview with NCBC's "Fast Money," McCaleb said that he firmly belives that for blockchain technology and cryptocurrency to survive, they both must remain decentralized. He said that any attempts to create a centralized payment protocol using crypto or blockchain technology will result in a "system that is no better than SWIFT or PayPal." ↑ Meet Stellar, the Cryptocurrency Poised to Be the Next Bitcoin and Ripple. Stellar. ↑ Home Page. Mt. Gox. ↑ Co-Founder Of Ripple, Stellar: Blockchain Needs To Be Decentralized To Be Successful. Cointelegraph. ↑ BITCOIN MAVERICK RETURNS FOR NEW CRACK AT DIGITAL CURRENCY. Wired. ↑ From London to Lynch: Take Our Gallery Tour Through the Berkeley Dropout Hall of Fame. Cal Alumni Association. ↑ THE RISE AND FALL OF THE WORLD'S LARGEST BITCOIN EXCHANGE. Wired. ↑ $1 Million Legal Fight Ensnares Ripple, Bitstamp and Jed McCaleb. Coindesk. ↑ Stellar Enters Legal Dispute With Bitstamp, Ripple and Jed McCaleb. Coindesk. ↑ Ripple Settles $1 Million Lawsuit With Former Executive and Founder. Coindesk. ↑ Meet Stellar, the Cryptocurrency Poised to Be the Next Bitcoin and Ripple. Time Magazine. ↑ Stellar Founder/Ripple Co-Founder Cites Importance Of Decentralization. CCN. This page was last edited on 30 July 2018, at 16:29.